This month's book club selection was When Breath Becomes Air by Paul Kalanithi. We have only read a couple of books this year, but this is already one of my favourite books. This is a non-fiction book written by a man diagnosed with cancer. He was doing his residency in neurology when he got this news. Although familiar with illness and death, he of course had to face this challenge as a patient, not as the doctor. 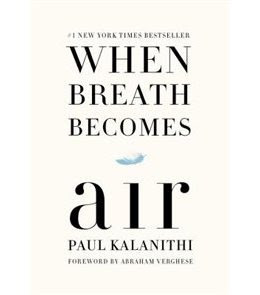 There are a few things I liked about this book - his reason for why he chose medicine for his career and then why he chose neurology as his specialty, his thought about his role in the lives of his patients and their families (how he breaks bad news, how he can contribute to their decisions, etc. ), and how he managed his cancer while still practicing medicine. I love hearing intelligent people speak (in this case write), and how they process information and how they clearly communicate their point of view. Two passages still stick out in my mind - one is about how he can be a man of science and believe in God. The other passage is the last paragraph before the epilogue and I don't want to give anything away so just read the book and you'll see what I mean. I would recommend this book to everyone. Most of us have been or will be patients at some point, and some of us will be confronted with cancer. He writes so candidly from the perspective of both a doctor and a patient - what is important to be said and what can go unsaid; how people should be treated and how their families are involved or not involved in the decision making. This is a short book and a very easy read. I would recommend not being in public when you're reading the second half of the book. I was sitting in the waiting room at Kal-Tire waiting for our snow tires to be changed when I was finishing it up, and I had to furtively wipe away tears (if I had been at home, I probably would have been sobbing). So yes, it is a sad book, but worth it. I will definitely add it to my book club reads come September. As an oncologist, this might be a good one for my husband to read as well.